What could be more unique this Mother's Day than the gift of being able to wear her wedding dress every day? This special piece of jewelry will remind her of one of the most important days in her life, because it is custom made from her wedding dress fabric or lace. A one of a kind piece of jewelry that no one else will have, designed to keep the memory of her special day close. I will need a 2" or larger square piece of your fabric to make each pendant. You can choose to send an under layer fabric if your dress is lace. Otherwise I will use silk or satin from my collection. I have a variety of colors available; please let me know what color you would like. Upon receipt of your order I will message you with the mailing address to send your fabric. 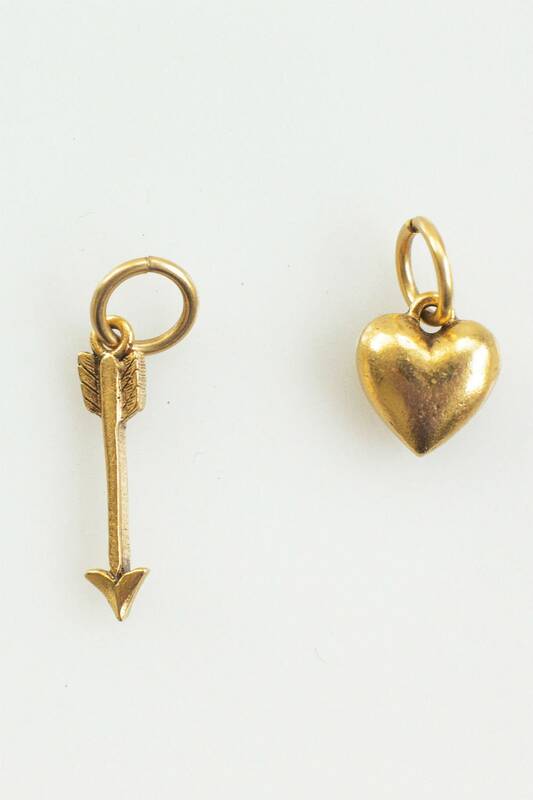 Pendant and heart and arrow charms are 24 karat gold plated over solid pewter, with an antique finish. Hangs from a feminine chain with tiny beads, also plated in 24 karat gold. 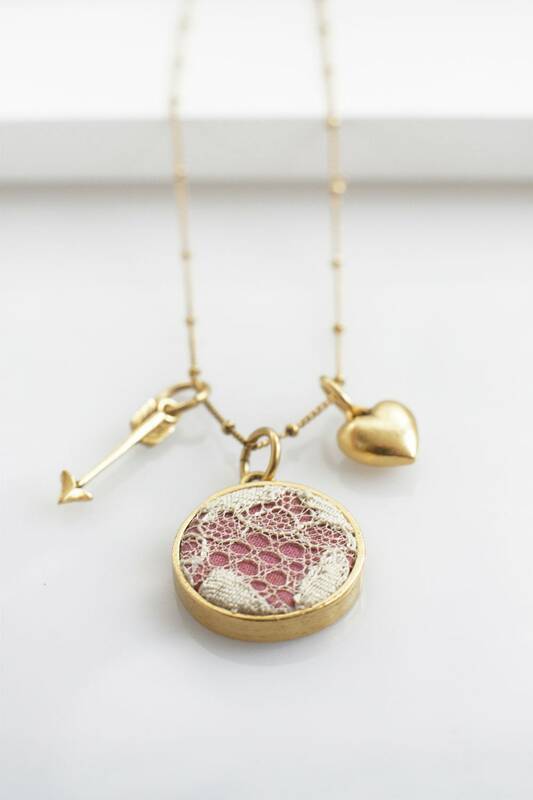 These necklaces are an exclusive design, handmade in Vermont and can only be ordered through Ceci Leibovitz. You will find no other necklace like this in the World and your own fabric makes your jewelry piece truly one of a kind. You can be assured that sturdy materials of the highest quality available are a top priority in my work. The pendant frames and charms I use are 24 karat gold and sterling silver plated pewter, and made in the USA. All of the chains are 24 karat gold and sterling silver plated solid brass. I use Czech glass beads to make the charms. Sourcing these materials is well worth it in my mission to create superior pieces that will last. 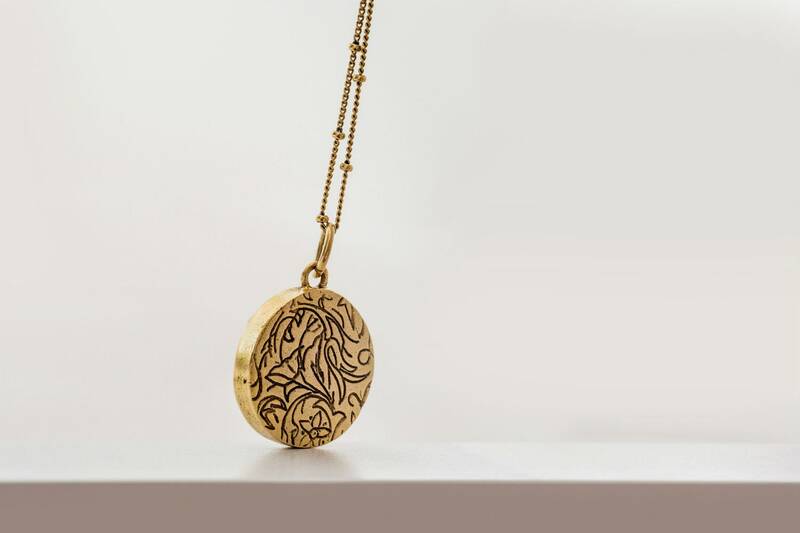 The back of the pendant is just as pretty as the front, with a scrolled floral engraving. See last photo for pendant back design. Treat your necklace with care and it will be enjoyed for many years to come. 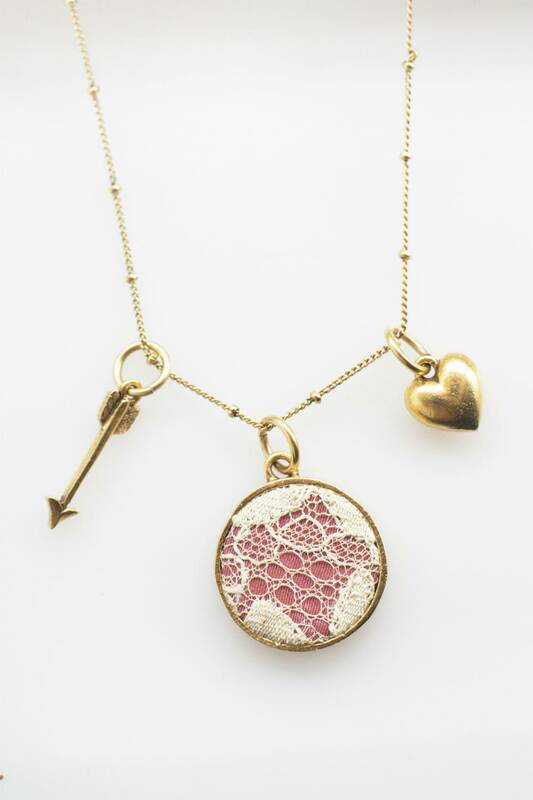 I recommend that you handle the pendant by the sides of its frame, rather than touching the fabric directly. Do not sleep or shower with your necklace and keep it out of the rain. 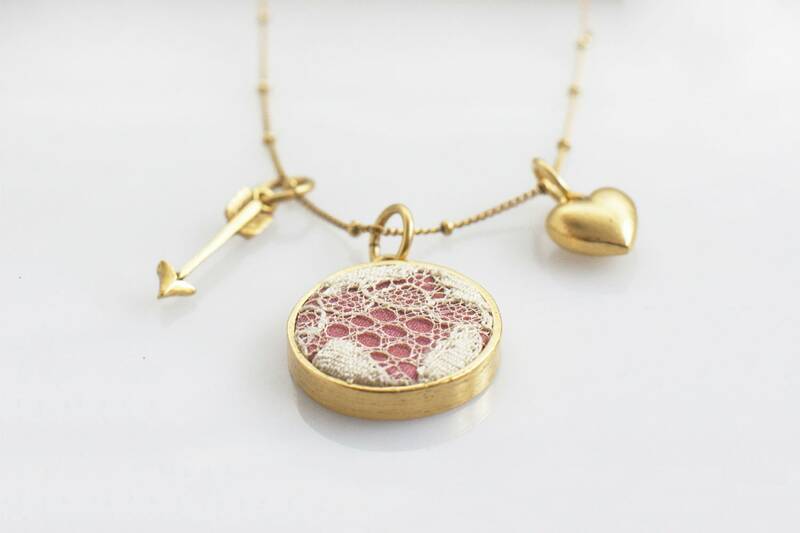 Using a polishing cloth for your necklace is not recommended, as it will dull the 24 karat gold plating. Your necklace will arrive in a gift box, ready to be gifted! If you would like to have the necklace shipped directly to a friend, be sure to include their address in the ship to section of your order. I would be happy to include a special message with your order if you would like; please include what you would like it to say in the "note to seller" section of the order. "I cannot believe how gorgeous this is and how fast you were able to make it!! !...This is absolutely perfect. I wouldn't change a thing about it!" "Thank you for my rose necklace. It's beautiful. I will treasure it always. "Your pieces are so beautiful, like little treasures." "Ceci is an endlessly talented jewelry maker, visionary and a beautiful soul too! She created (a necklace) for me from my wedding dress lace and every time I wear it I get to wear my wedding dress again. If you have a special fabric that you want turned into a beautiful piece of jewelry I highly suggest you get in touch with her."